The Nike Senior Designer speaks about the evolution of the LeBron 8 and teases the V/3. As we told you earlier today, Nike Basketball held a live Facebook Q&A chat with Senior Designer Jason Petrie. The focus of the chat was the newly released Air Max LeBron 8 V/2, a next generation performance shoe with an upper comprised entirely of Flywire and mesh. 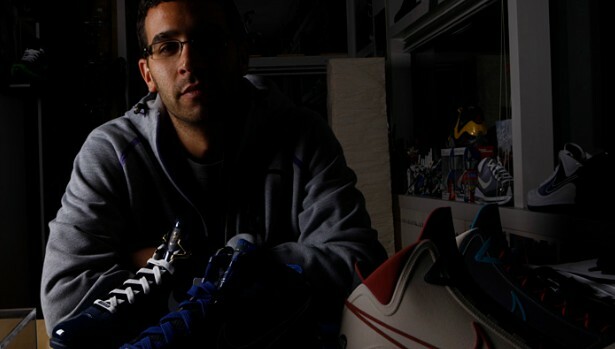 Petrie answered many fan-submitted questions within the allotted hour, speaking in depth about the creative process of the LeBron 8 and V/2. Toward the end of the chat, he gave us a little teaser info regarding the rumored LeBron 8 V/3, which he described as the "going for the kill" shoe in the lion-themed trilogy. -Black/Red Air Max LeBron 8 V/2 from the Portland game will NOT release. -"Entourage" / Photo Blue V/2 will be somewhat limited, but not "crazy" limited. -"Entourage" colorway inspired by a poster from the series. -The "Dunkman" shoe will not be a V/1. The pair DJ Clark Kent wore was a special sample. The "Dunkman" shoe was going to be a V/1, but plans changed. -Most likely will not see anymore V/1s produced. -Future colorways: Summit Lake, a shoe based on LeBron's favorite TV show and "Pre-Dunkman." -A "Dolphins" colorway of the V/2 was created, but probably won't drop. -LeBron has the last say in colorways that actually release and is a part of the design and color process. -"Nike iD? We'll see...I'd say the time is coming!" -"Mavericks" colorway of the V/1 will not release. -No High School colorways of the LeBron 8. The Soldier is the team offering from the LeBron line and the signature will be exclusive to the signature athlete. This may change next season, but this is the way it is for now. -No "Heroes" Packs will go public. -Currently working on LeBron 9. -The new LeBron logo will debut on the LeBron 9. -No plans to use Lunar. Too soft for LeBron. -No plans for Valentine's Day shoe. -No plans for a "Stewie" colorway.